KOZLOVSKY: Well first of all, I heard your announcement today, and it was not completely accurate. So I think it would be best if I started from the very beginning. The problem is that the apartment I rent is located in the Khamovnika region of Moscow. 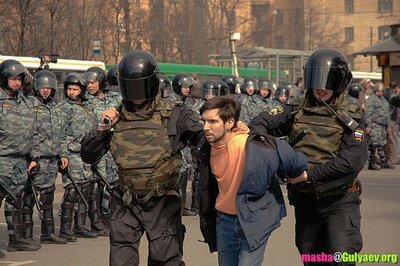 Activists of the “Oborona” movement meet there fairly frequently, as do activists from a variety of other organizations, for example the group organizing the demonstration “For a Volunteer Army.” Yesterday I was summoned to meet with a local police officer named Sergei Alekseevich Nikolaev. MAYERS: Did you bring a tape recorder with you? KOZLOVSKY: That has not been my habit up to now, but perhaps I should have, because it was very interesting conversation. What most impressed me was the man’s frankness. I had expected that there would be a problem of some sort, but usually they try at least outwardly to maintain a certain neutrality and legality, and look for some kind of normal justification that will make them seem more-or-less decent. But this time everything was right out in the open. Cynical and plain. In a way I almost have to thank him for not being sneaky about it. At the same time, they began putting pressure on my landlords. They told them that an extremist organization was located in their building. That they were practically preparing acts of terrorism. I was told that if I did not leave voluntarily they would turn to the homeowners of the building, who would write complaints that we were loud, held drunken parties, engaged in debauchery, and bothered everyone. That I would be visited every day by the police, who would conduct searches and force everyone to submit written explanations for their presence. In general, they would use every means to force us to leave. The policeman added that he would send reports to the FSB, MVD headquarters, and every other agency of that type, in which he would include any political publications that mentioned “Oborona”, so that they too would take part in this process. In other words, the situation was made absolutely clear, with no attempt at creating any kind of legal basis. Just a completely brazen, simple, cynical racket or more exactly – blackmail. MAYERS: So you didn’t actually engage in any drunkenness or debauchery there? It’s a little hard to imagine, given that hot-blooded young men from the “Oborona” movement were gathering in your apartment to talk about the current realities in Russia. GANAPOLSKY: How do you know they were hot-blooded? MAYERS: And maybe with girls too. Are you sure you never raised your voices there? KOZLOVSKY: Our hot-blooded young men and women know all too well that we are under constant scrutiny, that we need to cross the road at the right place, so that no one will take notice of us and detain us. We’ve had things like that happen to us, where the OMON riot police have detained us literally for crossing the street in the wrong spot. So obviously, in the places where we meet, we strictly adhere to the letter of the law, so as not to give them the slightest cause to pick on us. GANAPOLSKY: What does you landlord think about all this? KOZLOVSKY: I spoke with my landlords about all this in fairly great detail even before this conversation, and they were inclined to abide by the rental agreement, at least until it expires in July. But after that, they said, weâ€™ll have to wait and see. GANAPOLSKY: And what was the result of the pressure they put on your neighbors? KOZLOVSKY: I don’t know yet. But I think it is entirely likely that they will start writing things, because people do not usually want to argue with police, and in any Moscow entryway you can find one resident or another who will gladly create a stink against anyone. Especially if you tell them that these people present a great danger, are criminals and extremists, and may blow up your building any day now. GANAPOLSKY: We can imagine that his will be set in motion too, because once someone decides to take up this task, it becomes his sacred mission. It’s also possible that the policeman is being pressured himself to get you out of there. Do you plan to leave, or do you have any way of defending yourself? KOZLOVSKY: Legally, and according to my rental agreement, we have the right to remain in this place for as long as the agreement is in force, and we plan to do that. If they try to evict us by some illegal means, we will defend ourselves. Both by all legal means, and simply physically, we will hold onto this place, because the police have no legal grounds for their demands. GANAPOLSKY: But what if the landlords on their own revoke the contract, claiming that they have a sick grandmother coming in from Narofominsk? KOZLOVSKY: Then that will be decided in court. Until the court decides that there is actually some legal basis for evicting us, we will stay here. We have fulfilled all our obligations, and we continue to fulfill them. We have always paid our rent on time. So there is not going to be any backing down on our side. GANAPOLSKY: A lot of our radio listeners probably do not know about your movement. What are your aims, your goals? KOZLOVSKY: On the one hand our aims are enormous, on the other hand they are nothing less than absolutely necessary. These are, foremost, the establishment in Russia of a political system which will allow regular citizens to have an influence on events in the country, on who they elect, on what these elected representatives do; a system that will provide a return channel of communication between the government and the people. Right now there is nothing like that. I don’t think anyone right now entertains any illusions about the influence we can have on any of the country’s decisions. GANAPOLSKY: So what are you going to do about it? Where’s the struggle? KOZLOVSKY: First of all, this is, of course, about working with people, with society. Because the root of the problem is always buried there: In the fact that our people usually either do not know their rights, or are afraid to defend them; in how our people often take it as normal that the government is allowed to treat them like dirt – at best, as nothing more than tax-providers. So we work through the Internet, carry out protests, try and reach people through the mass media. We also go out and distribute leaflets, newspapers and bumper stickers to young people, students, and those who have finished, let’s say, college. And in this way we make contact with a fairly large number of people in Russia. Probably tens of thousands of people every year. GANAPOLSKY: And how many of you are there? KOZLOVSKY: There are about one thousand of us in Russia. GANAPOLSKY: Do you ever get the sense that this campaign of repression that is underway is not directed against your movement, against your one-thousand people, but against you personally? I’m thinking of your story with the army. And now with your apartment. KOZLOVSKY: The story with the army recently came to a complete close. Exactly two weeks ago I told you here how it went. In December I was illegally inducted into the army for two and a half months. I was released just two days after the end of the elections, when it became clear, in their opinion, that I no longer presented any particular threat. MAYERS: But as you can see, you do present a threat. Especially with your logo. KOZLOVSKY: I don’t think this is just about me. I may be a sort of additional irritant, but one soldier does not make a battle. I don’t think that as just Oleg Kozlovsky I have the power to irritate anyone. More likely, it is the activities of the organization itself, its various members, who continued the organization’s activities in my absence and continue them now after my return. And, to be sure, this complicates the lives of the authorities. GANAPOLSKY: Who are your role models? Or is it to each his own? KOZLOVSKY: I would not call any of the current crop of politicians our role model, hero or leader, either formally or informally. That’s because we are made up of a lot of different types of people, with different sympathies and interests. Our people have many different points of view. There are liberals, those of a leftist point of view, and patriots. But I think that in our methods or perhaps in the way we view our work, we are closest to Mahatma Gandhi – with whom Putin never would have had anything to say, by the way. But if for Putin this was just a joke, we regard Gandhi’s activities with absolute seriousness. These were the sort of people who, resolutely without the use of force, and guided by their ideals, fought for their ideals. GANAPOLSKY: Let’s take a vote. Sitting here with us is Oleg Kozlovsky, and I want to ask everyone: What do you think, should Mr. Kozlovsky, along with his comrades and his magazines, and his singing of revolutionary hymns – not too loud, mind you, so that now one should hear what they are doing – should he be forced to leave this apartment. KOZLOVSKY: Yes. And the further away the better. Because God only knows what they are doing in there. He says one thing, but maybe they are doing something completely different. KOZLOVSKY: Need to move at least 101 kilometers outside Moscow. GANAPOLSKY: I didn’t say it, he himself said it! Call and you can tell Mr. Kozlovsky himself what a bad guy he is. Because there is a certain percentage of our listeners, and not just the young ones, who think that he and his friends should get out. Hello. GANAPOLSKY: Understood. This is not an office. It’s an apartment, not an office. KOZLOVSKY: Right. Let me explain why we have the right to be there. The â€œOboronaâ€ movement is not registered, so there is no violation of the law. It is not required to register by law. Accordingly, it has no legal identity, and therefore cannot rent an office, apartment, hall, or anything. GANAPOLSKY: There you have it. KOZLOVSKY: But we have the constitutional right to assemble. GANAPOLSKY: I asked that only those who think that he should leave should call! Anyway, whatever the authorities may think of someone, whatever you allow yourself to be called, and that’s what you become. The authorities do not consider me, for example, trash, because I don’t allow them to. And apparently you don’t allow them to either. MAYERS: And Oleg Kozlovsky so far is not allowing them to evict him from his apartment to somewhere 101 kilometers outside Moscow. GANAPOLSKY: They haven’t tried to yet. MAYERS: What do you mean, of course they have. LISTENER: Where is this Kozlov registered, anyway? GANAPOLSKY: Secondly, you need to introduce yourself. GANAPOLSKY: And third, it’s not Kozlov, it’s Kozlovsky. LISTENER: Where is he registered? KOZLOVSKY: I am registered at the apartment where my parents live, in Moscow. LISTENER: Then go to your parents’ apartment and hold your meetings there. LISTENER: Well, who needs him here anyway? GANAPOLSKY: Who do you mean by “who”? MAYERS: And where is here? LISTENER: Well, in this building. GANAPOLSKY: Well, who needs you on this radio program? GANAPOLSKY: You heard him, right? MAYERS: I had nothing to cover my ears with. GANAPOLSKY: Yeah, they’re out there. MAYERS: And I so adore them. GANAPOLSKY: Go get your prostrate gland massaged, Konstantin – believe me, it will help. Next question. LISTENER: Good afternoon. Aleksandr, in Ivanteevka. I think the authorities are proceeding absolutely correctly, even if it is by an illegal route. Because all of Russian history shows that from meetings like this both the “will of the people” and the Bolsheviks can gather together and pick away at the authorities. So of course they have to nip it in the bud. GANAPOLSKY: You really think that? GANAPOLSKY: Well let’s talk about this. Maybe you have a point. KOZLOVSKY: This is a very good commentary. The caller exceptionally well, in my view, reflects the official position: “So what if it is illegal, it’s still the right thing to do.” And here lies our problem. For us, the law was not written for the government to abide by. The law applies only to individuals. And it can be used against them. GANAPOLSKY: Wait a minute. You’re being ironic. You’re telling a joke. LISTENER: No, I’m not joking. GANAPOLSKY: Which side did you vote on? KOZLOVSKY: That he should be evicted. GANAPOLSKY: Explain why that is so. Kozlovsky has said that there is no real legal basis for this. So? MAYERS: But you are saying maybe not under the law, but by an understanding. LISTENER: Why by an understanding? LISTENER: Because every government has to defend itself. That’s what it was created for. MAYERS: It was created for that? KOZLOVSKY: I thought the government was supposed to be used to defend us, its citizens. MAYERS: Any person should be defended from other people. GANAPOLSKY: There are listeners who play this game. He’s say, sure, if we were in America, then of course they should fire this policeman. But since we live in Russia, it’s completely understandable. And that explains why you should be kicked out of your apartment. In other words, he’s generally a liberal, but in this case he will explain why you need to be kicked out. This is very elaborate. You won’t be able to grasp this, Kozlovsky. You’re out there with your Oborona, working with the people, but we have such a unique group of people here on the air. KOZLOVSKY: All our people are unique. too, for example, well before 14 December – many kilometers out. GANAPOLSKY: Okay. We need to finish up. You are gradually going to become a regular on “Echo Moscow” radio programs. Because first they haul you off somewhere, then they try to kick you out of somewhere else. First into the army – instead of kicking you out, they hauled you off. And now you’re back in your apartment, and instead of just leaving you alone, they try to kick you out. What’s a guy to do? MAYERS: The vote is finished. By 82% to 18%, listeners do not support the position of the authorities. GANAPOLSKY: Thanks for coming. As you know, we can’t draw any conclusions from this program. And we also can neither support nor condemn you. This is just civil society, such as it is. And you see what it is. MAYERS: How civil it is. GANAPOLSKY: But we gave you some airtime so you could tell us about the moral values of this great land, which is getting up off its knees in such an unusual way. The Russia is becoming Imperia! Putin is not prime minister, he is the king! There is no democracy in Russia!